Perfect Nonsense: The Chaotic Comics and Goofy Games of George Carlson by Daniel Yezbick (Fantagraphics, February, 2014) is a toy chest of lost graphic delights, particularly for those comic art fans who have longed to know more about the creator of those vertiginous Jingle Jangle stories. While this lavish art book on the singular cartoonist, illustrator, sequential graphic storyteller, puzzle-maker, and game designer George Carlson is something to be celebrated, it is not without problems. What we have here is A Book on George Carlson, and not The Book on George Carlson. Of all the significant comic book artists of the twentieth century, George Carlson has been among the most magical and yet the most mysterious. Accomplished critics and historians including Harlan Ellison, Franklin Rosemont, Bill Blackbeard, Martin Williams, Ron Goulart, Martin Gardner, Gary Groth, Art Spiegelman, and Dan Nadel have championed George Carlson’s comic book stories. He’s been widely regarded as a master of Golden Age comic book art and graphic storytelling. His imaginative, trippy work has been associated with various art and literary movements, including Surrealism, Dada, Art Deco, and Absurdist. Carlson’s stories have been compared to the works of literary masters Samuel Beckett and Eugène Ionesco. Miscellaneous reprints, all drawn from the 39 extraordinary comic book stories that originally appeared in Jingle Jangle Comics between 1942 and 1949 have kept the flame of interest in Carlson’s work alive over the last three decades. Despite all this, information about the life and work of George Carlson, as well as any additional art beyond the Jingle Jangle stories, has been frustratingly skimpy. That is, until the recent emergence of Perfect Nonsense, a generous 315-page collection jam-packed with rare art from (nearly) all of the many phases of Carlson’s long career, most of which have been largely unknown to any but a few determined scholars and collectors. The book opens with a one-page forward by Allison Currie, a great-granddaughter of George Carlson who has helped Yezbick solve the puzzle of the puzzle-maker’s life and career. Next, an introduction by comics historian and Comics Journal columnist R.C. Harvey sets the stage by discussing his initial disdain of Carlson's "knobby drawings," (a reaction many newcomers have) and his eventual embrace of and deep love for Carlson's Jingle Jangle comic book stories. This is followed by an information rich 35-page essay by Daniel Yezbick on Carlson’s life and work and approximately 350 pieces of rare art (and a few photos). The book closes with a 70-page sheaf of impeccably restored, head-spinning comics from Carlson’s Jingle Jangle stories. These reclaimed and new treasures are bound between thick boards splashed with orange as bright as a Florida sunrise. However, instead of his trademark anthropomorphic objects, smiling suns, and friendly figures, a different side of Carlson’s art that is more abstract and bold emblazons the book’s cover, signaling that this book will be for most a journey of discovery, with new sides to the artist revealed within. The front board features an ornate die-cut window, offering the same playful novelty inherent in much of Carlson’s own work. Perfect Nonsense is clearly a labor of love by editor Daniel Yezbick (as well as Fantagraphics, who may have nobly committed economic self-damage by publishing a giant expensive book on this relatively obscure artist). Yezbick, a college English teacher, has spent years gathering and studying Carlson’s works (see his ground-breaking 2007 essay on Carlson, “Riddles of Engagement”). He visited numerous archives, where he tracked down rare source materials. Yezbick even befriended the Carlson family, who provided him with information and access to the family's archives. The puzzle of George Carlson is not just who he was, but how his work explores the surreal worlds of interior landscapes so cheerfully and chastely. At last -- photos of the man are available in PERFECT NONSENSE. George Carlson in the 1930s, with daughters Alice and June. (Courtesy of the Bishop and Morgan families). A few of George Carlson’s delightful illustrated nonsense letters written to his family are included in Perfect Nonsense. It’s nice to know that a man who worked for decades in the field of children’s magazines, books, and games loved children himself. While Yezbick's biographical essay in Perfect Nonsense is presented in a clear, chronological fashion, the large mid-section of the book falters with some structural problems. The rather eccentric choice to arrange a gallery of Carlson’s work in fairly superficial thematic chapters and sub-chapters such as portraits, trains, seasons, and advertising fails to support the study of Carlson’s development as an artist and storyteller that a more chronologically linear presentation could have offered. For example, the sub-section on Carlson’s book illustrations presents varied examples from books originally published in 1913, 1936, 1917, 1919, 1928, 1917, 1921, the mid-1930s, and finally 1938 -- in that order, making it impossible to derive an understanding of Carlson's development as a book illustrator. Some sort of chronological listing of Carlson’s work in the back could have helped balance the chronological chaos of the book’s thematic arrangement, but alas this important resource is not provided. To add to the confusion, the art presented in Perfect Nonsense is not consistently cited. For example, the caption to a set of seven book illustrations from Washington Irving’s Legend of Sleepy Hollow and Rip Van Winkle tales states that they are from 1913, but does not mention the actual publication title. A vivid, fetching, and unidentified eighth illustration precedes this set, on a facing page, and while it seems from the nearby caption as if it could be from the same unnamed 1913 source, one must remain as much in the dark about this and related mysteries as Ichabod Crane on his night ride. Unfortunately, the decision to forgo a detailed and consistent citation scheme plagues Perfect Nonsense throughout most of its pages, robbing the book of a valuable cultural and historical dimension. The text, for all its insight and erudition, is similarly marred by a lack of citations for sources. For example, Yezbick has woven in various quotes from George Carlson -- a coup, since interview material has been heretofore unknown -- but not knowing where these quotes come from strips the material of context. Are we reading journal entries, newspaper interviews, or quotes from letters? When did Carlson say these things? It would be good to know. Issues of formatting aside, there is plenty here to satisfy one’s curiosity about Carlson's work. The sections on his lengthy tenure as the lead designer with the children’s magazine and book publisher, John Martin, are particularly enlightening, if perhaps a bit unbalanced, with about a third of the page count given over to this material. Carlson created for this publisher an awe-inspiring variety of appealing -- and sometimes -- stunning magazine and book covers, ads, cartoons, illustrations, cartooning tutorials, puzzles, games, and even paper toys, all of which are represented in Perfect Nonsense. One of the more successful sections in Perfect Nonsense presents a gallery of the jaw-dropping Wanamaker's Jollybooks – opulently designed and illustrated magazine-like catalogs for the Wanamaker department store. Yezbick makes the point that these "little forgotten wonders of fun" anticipate the early comic book promotional giveaways. The biggest -- and most serious -- problem with Perfect Nonsense is that it is not a complete representation of Carlson's career. Amid its spectacular embarrassment of riches there are almost none of Carlson’s non-Jingle Jangle comics. The book offers 70 sublime pages of his Jingle Jangle stories -- but there's a lot more to the picture of Carlson as a comics creator, and none of it is in this book. "Soon after his Whitley County excursion, Carlson began developing a considerable reputation as a freelance artist and cartoonist, submitting winning gags, drawings, and cover paintings to Judge, Life, and Scribner's, as well as the children's periodicals St. Nicholas, Child Life, Youth's Companion, and Junior Magazine, In the mid-1910s, Carlson developed the sequentially intricate "Judge's Motion Pictures" feature consisting of complicated, kaleidoscopic designs that foreshadowed the graphic innovations and ocular tricks of his later works." Kaleidoscopic designs that foreshadow graphic innovations -- these are words to make a comic art aficionado's heart beat faster -- and yet, not a single example is provided. These early comics are extremely important to include in a serious study of Carlson's work because they contain the seeds of the fanciful ideas and wild narrative rhythms that blossomed thirty years later in the Jingle Jingle stories. As a side note, it's also not entirely clear that it's correct to give Carlson credit for developing Judge's innovative "Motion Pictures" feature as Yezbick mentions, since earlier examples from 1911 have been discovered of a similar Judge feature by H.C. Greening. In any case, it's impossible for a reader to sort this out using Perfect Nonsense, since it includes none of this important material. The study of a cartoonist's early works is essential to developing a deeper understanding and appreciation of their mature work. Perfect Nonsense could have been a much stronger, and more definitive collection if there were less of the hundred-plus, somewhat interchangeable, pages of art from John Martin's Book, and a section of Carlson's early cartoons, paintings, illustrations, and especially his comics for magazines. Carlson's early comics are featured in the original cover design for PERFECT NONSENSE, which appeared on Amazon's website for years while the volume remained unpublished. The finally published book sports a different cover, and none of these culturally and historically valuable early comics. And then there's Carlson's newspaper comic strip career in the 1930s and 1940s, which overlaps with his Jingle Jingle comic book stories. A ghost artist for Gene Byrnes on the syndicated strip Reg’lar Fellers, Carlson created a large body of work that bears his hand, if not signature. And yet, not a single example of the published Reg'lar Fellers or Dizzie Lizzie strips that Carlson ghosted is included (there is a single piece of unpublished Carlson art of the Reg'lar Fellers gang included). Similarly, the text dispenses with this part of Carlson's career in a few sentences. 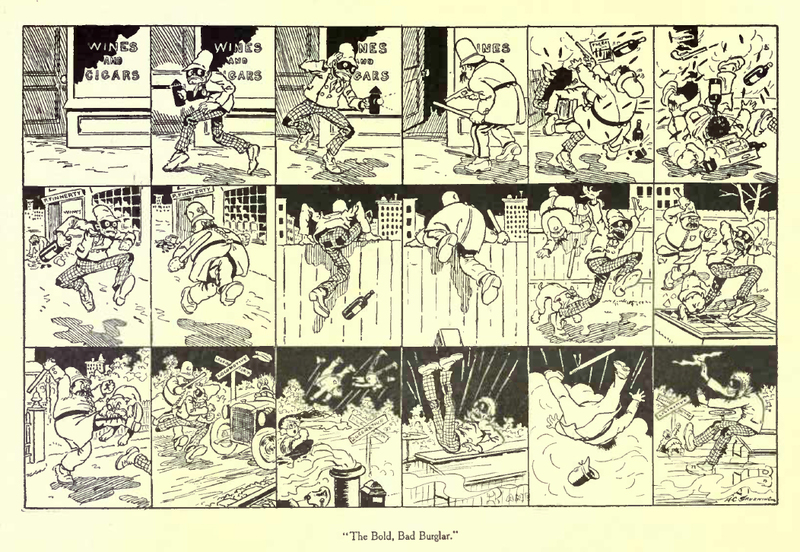 While these comics are minor to a study of the history of the American newspaper comic strip, they are absolutely central to a meaningful study on George Carlson's work. Dizzie Lizzie is a bridge between Carlson's early experimental comics and the fully developed zany Jingle Jangle stories. It's difficult to understand why Fantagraphics -- a premier comics publisher -- failed to make this book a more robustly comics collection. The list of vital omissions from this collection goes on, like a Carlson-drawn scroll unrolling from the hands, down the legs and onto the floor to say, "where are the many boxed book sets Carlson created, the jaw-dropping 1913 Life cover with Santa Claus, the 2-page spread that offers a gallery of all of Carlson's covers for John Martin's Book in chronological order, an example of Carlson's long-running work for the Girl Scouts' American Girl magazine, the published 1940s dust-jacket art for major publishers, examples of the original art for the Jingle Jangle stories, and the Gone With the Wind cover (perhaps Carlson's most famous work, and one that Yezbick wrote about with great insight and eloquence in his 2007 essay)?" One supposes that the dust-jackets, including Gone With The Wind were excluded due to legal issues, however no explanation for this conspicuous absence is provided. The material that is offered, however, is masterfully restored and certainly entertaining -- and deserves all the moon-sprinkled kudos in the world for this. In particular, the book’s pristine Jingle Jangle stories are recreated so well that even for someone familiar with these stories from their original, muddy publications, they have such newly minted brilliance, it is as if one is coming to them for the first time. The original colors are maintained as printed, but the art is cleaned and brightened up. The pages are presented slightly larger than published, which helps Carlson's compressed pages (and the reader) breathe. These stories have never looked – or read -- better. An elaborate illustration by George Carlson from his unpublished children's book manuscript, ALEC IN FUMBLELAND. Perhaps the Alec book(s), and more volumes of Carlson’s art, comics, puzzles, and games will someday be published. One certainly hopes so. Daniel Yezbick and Fantagraphics have accomplished the worthwhile and seemingly impossible task of creating a considerably more complete understanding of the life and work of the modest, quiet genius that was George Carlson. While not without serious flaws, this big beautiful book goes a long way towards fleshing out, and calling attention to the career of an under-appreciated twentieth century master cartoonist, illustrator, sequential graphic storyteller, puzzle-maker, and game designer. A 34-page PDF excerpt from Perfect Nonsense, as well as a video flip-through can be found at Fantagraphic's website, here. Examples of George Carlson's early magazine cartoons and his newspaper comics can be found in the Comics Journal articles "Figuring Out George Carlson," Part 1 and Part 2. Proof that there is enough fine Carlson work to fill several volumes, a PDF of a gorgeous booklet designed and illustrated by George Carlson for John Martin's House in 1920 to advertise Remington typewriters can be found here. Paul, Do you have exact or close beginning and ending dates for Carlson’s work on “Reg’lar Fellers”? I’m planning on re-reading that era of the strip with Carlson in mind. Patrick – I haven’t yet established the start and end dates. I was really hoping Perfect Nonsense would have more information on this. In the book, Daniel Yezbick writes that Carlson ghosted the strip “for decades,” but is no more precise than that. According to Allan Holtz in his American Newspaper Comics, the strip ended January 8, 1949. Holtz also writes that Tack Knight (great name for a cartoonist) assisted 1924 to about 1928-29. Later assistants were Burr Inwood (that sounds like a fake name to me) and George Carlson. So — that’s what I got at this time. I’ve spent quite a lot of time digging around microfilm archives and it seems to me that Carlson’s touch prior to 1940 or so is sporadic, if at all. The Dizzie Lizzie Sunday topper of the early 1940s is the best part of the deal for me — far more whimsical and wacky than Reg’lar Fellers, and most other strips, too. Paul, Thanks. Maybe I’ll begin reading in 1940 and then see if anything jumps out at me as I move forward. Just to be clear. By “ghost” it’s assumed to be Carlson writing and art? If he was also lettering that could be a clue. I am not sure if “ghosting” a comic strip means art and writing, or just the art. Really, I think it could mean either. In George Carlson’s case, I am pretty sure he wrote the Dizzie Lizzies, and I seem to detect some of his pet themes surfacing in Reg’lar Fellers, which would suggest he wrote as well as drew at least some of them. As far as I can tell, unless it was a straight illustration job for a story or book, Carlson tended to do it all — writing, penciling, inking, lettering… like most comic art masters. That’s a good thought about the lettering being a clue to actual authorship. It all certainly bears more study. Let us know out here, if you would be so kind, if you make any discoveries in your reading of the series, Patrick. Ghosting absolutely can mean both or one, or the other. A good example would be Alex Raymond ghosting Tim Tyler. Or Frazetta ghosting for Capp. Or were they assistants? I’ve got everything assembled 1939-1948. Glancing at the strips from 1939 one thing I noticed right away is an unusual “G” letter form with an exaggerated spur so that the form almost resembles “Ct”. That letter form vanishes in early 1941. Not to say that means much of anything. It may be an attempt to modernize the look of the strip? Anyhow, it goes away and looking ahead to 1948 seems to never come back. Good detecting, Patrick. I’ll study the g forms when I get the chance. It might be fruitful to compare Carlson’s lettering in his Jingle Jangle stories to the comic strips. Of course, as a ghost, he may have been obligated to stick to Byrne’s established lettering style. The exaggerated spur on the Gs that you noticed appears to be evident in the opening narration box of the page from the first Pie-Face Prince story that is contained in my review, above. What do you think, is it similar?